The overload detection module of HYDROSURGE software performs continuous diagnosis of any pressure event to detect the risk of exceeding the admissible maximum pressure over each section of the penstock. 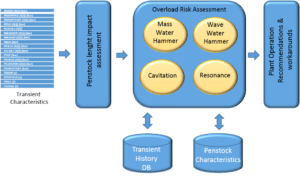 From only one pressure tap on downstream end of the penstock, inside the plant, an assessment of the impact of the transient along each point of the penstock is conducted to detect potential security risk in each section. ODM detects any Wave Water Hammer phenomena (or rapid water hammer) to ensure that the speed of the transient flow drop will not create a propagating surge wave that could exceed the admissible maximum pressure over sections of the penstock and damaging its structure. ODM detects any risks of Water Column Separation phenomena to ensure that the speed of a sudden increase in flow rate will not create a propagating drop wave, causing cavitation over the penstock and finally a large void cavity. This cavity that collapses when the pressure recovers causes strong overpressure in upstream sections of the penstock. ODM detects any risks of resonance by checking if the pressure cyclical pattern levels are properly amortized and will not drive to self-sustained pressure fluctuations and dangerous structural fatigue damage. The mass water hammer phenomenon is only related to the inertia of the water column located upstream of the component which cuts the flow. Closure time is longer than the return time of the reflected wave from the top of the penstock. The affected area is the downstream part of the water system: penstock sections, manifolds, unit casings. Wave Water Hammer phenomenon resulting from a quick drop in flow. The closure time is shorter than the return time of the reflected wave. The affected area is meanly the upstream sections of the penstock. This phenomenon is related to the overall compressibility of the water in the penstock.Thus, safety requires to quantify the maximum pressure profile reached along the penstock for each transient event. HYDROSURGE has been design to detect early signs which may lead to Wave Water Hammer phenomena. Water Column Separation phenomenon resulting from a rapid increase in flow. The opening time is shorter than the return time of the reflected wave. The affected area is meanly the upstream sections of penstocks. Thus, hydro safety requires to quantify the minimum pressure profile reached along the penstock for each transient event. HYDROSURGE has been design to detect early signs which may lead to Water Column Separation phenomena. Self sustained cyclical pressure fluctuations may cause low-cycle fatigue damages of penstocks. The whole sections of the penstock are affected. HYDROSURGE has been design to detect early signs of behaviours which may lead to self-sustained cyclical pressure fluctuations for each transient event.